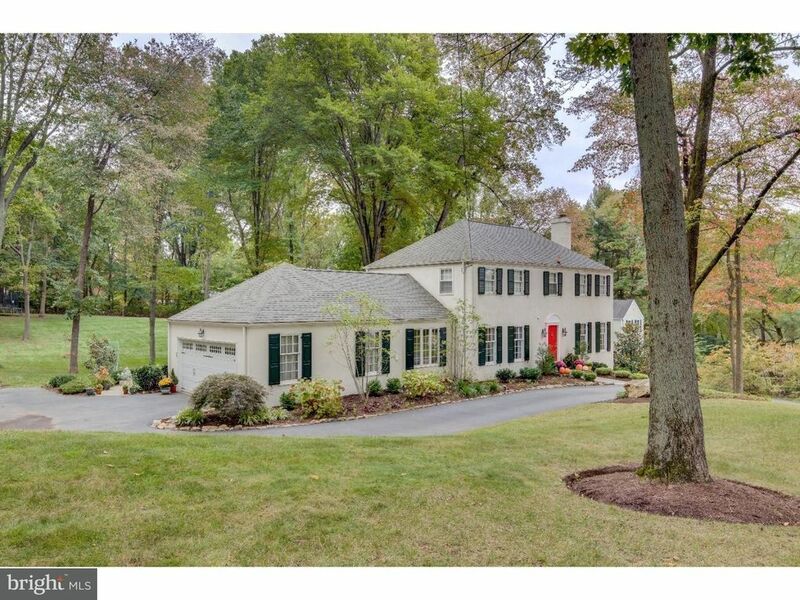 Beautifully updated 4 BD, 2.5 BA French colonial on a park-like .88 acre lot in Radnor Twp. Gleaming wood floors, enhanced millwork, recessed lighting, and designer finishes abound. Gracious center Entrance Hall opens to the formal Dining Rm and Living Rm w/fireplace and large windows on 3 elevations. The totally renovated and expanded Kitchen is the heart of the home, with gorgeous custom cabinetry, granite counters, tile backsplash, breakfast bar, and gourmet appliances incl. Bosch frig & dishwasher, 6-burner Thermador gas range and double wall ovens plus warming drawer, and distinctive copper farmhouse sink. The Kitchen is open to the Family Room/Breakfast Room. The Kitchen also has a built-in desk, bench, and direct access to the over-sized 2-car garage. The unusually large Laundry/Mudroom has extensive built-ins, cubbies, and a large closet. Upstairs is a Master BD w/3 closets and an En Suite BA. 3 Hall BD share a Hall BA, plus there are 2 linen closets. The unfinished Lower Level has loads of room for storage and ample room for add'l living space. The large deck offers great space for outdoor entertaining and sweeping views of the scenic yard. Located in the Newtown Square area of highly-ranked Radnor school district, this home is close to parks, schools, train, shopping, & restaurants in the charming villages of Bryn Mawr and Wayne. Convenient access to the Blue Route, Center City, Airport, and corporate centers.